A lot of rivers, mountains, and land features are named for the color in which they appear. According to the Wikipedia disambiguation, there are eight land formations, and three towns named “Green Mountain”. This, in addition to the “Green Mountains” in Vermont, which refers to the entire mountain range. 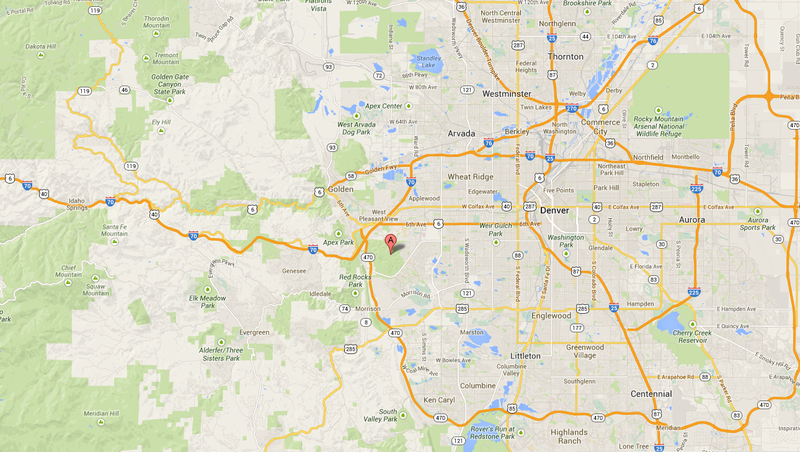 The Green Mountain I am referring to here is the one in Lakewood, CO, inside William F. Hayden Park. What makes this particular mountain so special is it’s location. At 6,855 feet, it is not particularly tall, but it is amongst the first actual peaks that one would come across as they travel to the West. At least geographically speaking, it marks the border between the Great Plains to the East, and the Rocky Mountains to the West. It is also only 12 miles from central Denver, and is known to be one of the places that dries out the quickest after a precipitation event. So, if there is a place to check out on a nice sunny day only half a week after one of the worst flooding events in Colorado history, this is the place. To get to William F. Hayden, I rode my bicycle, as it is only 12 miles away from my apartment, and I found a route through Lakewood, mostly on 1st Avenue that did not involve the bicycle trails, most of which are in river valleys in this area, and could still be muddy or sandy from the recent floods. Most of this route, heading to the west through Lakewood, is a steady but slight uphill climb. However, after I cut over to Alameda Ave. and followed the path alongside that road to the West and Southwest, the climb got steeper. By the end of this climb, I was already at an elevation over 6100 feet. This means that I had already done most of the climbing on my bicycle, before I even started this trail. 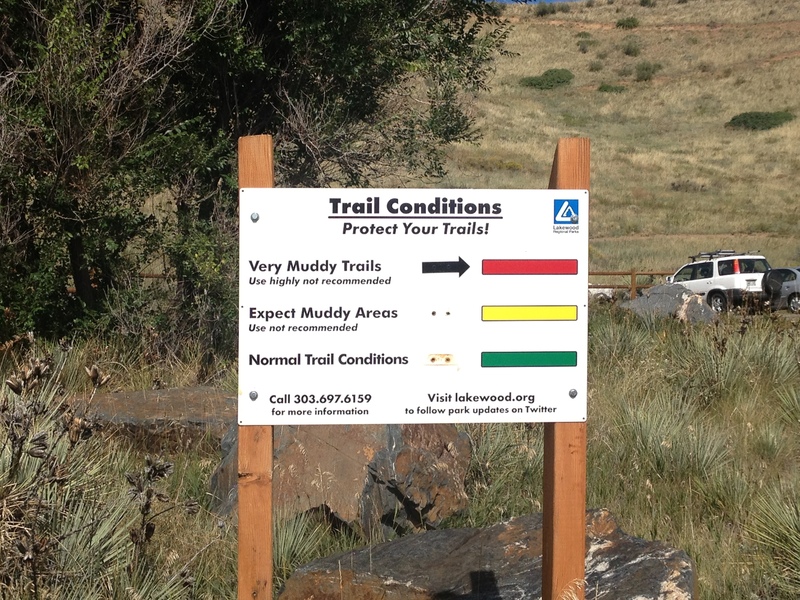 Upon entering the parking lot, I was surprised to see that the trail conditions were still labeled as “Very Muddy”, and that they were still not recommending use. I am assuming that these ratings were designed mostly with mountain biking in mind. Still, the idea of a “very muddy trail” does not appeal to me for hiking, and I traversed the parking lot expecting not to be able to hike at all, but prepared to be satisfied with my bike ride. However, I saw a lot of people, both hiking and biking the trails, and they appeared fine. 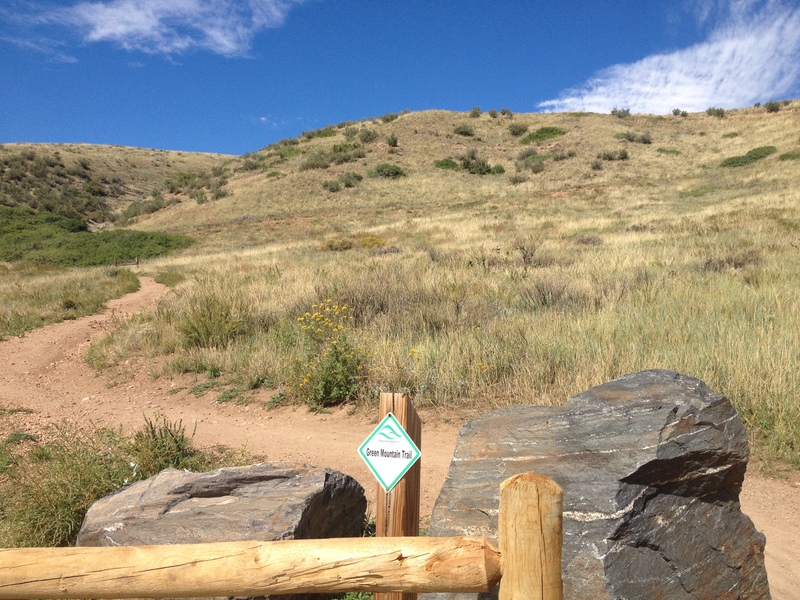 Two mountain bikers, who appeared to have already used the trails, confirmed that the conditions would be fine, so I decided to assume that the sign above was not updated, and hike the remaining 700-ish feet to the top of Green Mountain. There are several routes to the top of this mountain, but the best option for someone who really wants to do some uphill hiking, traverses a radio tower, which is near the top. 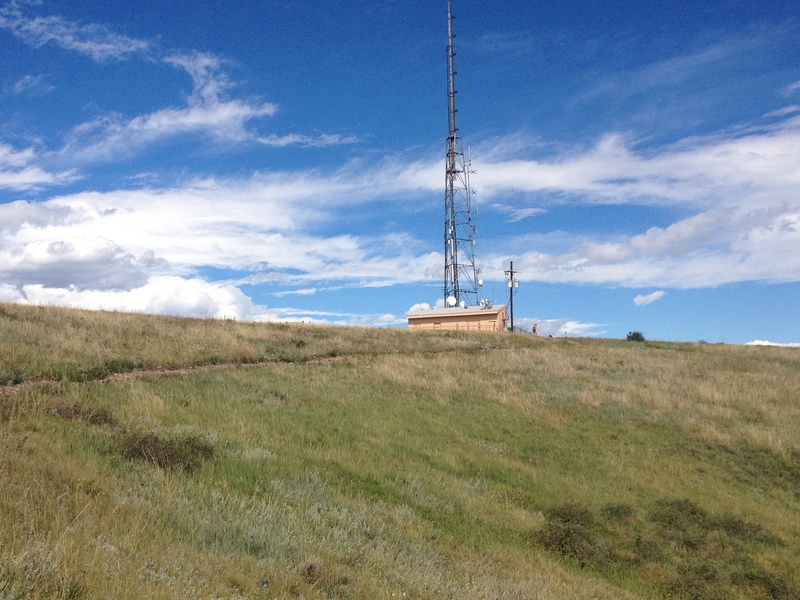 Although this may take away from the pureness of a hiking experience, it seems to me like a good idea, from a scientific perspective, to have a radio tower on top of a hill, where it can reach more people. The top of this hill did feel like looking at the edge of two worlds. Looking to the West, one could see the Rocky Mountains, well, mostly the foothills, but it was clear that anyone headed west would encounter taller and taller peaks. Gazing Eastward there is a pretty good view of the skyline of the city of Denver. 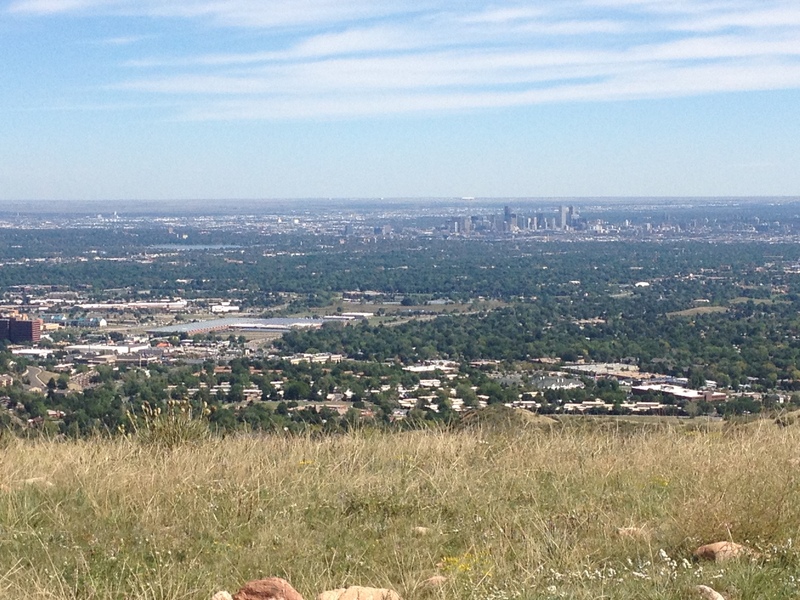 In fact, observing the skyline of Denver from Green Mountain kind of reminded me of all of those iconic movie and T.V. show scenes where a small group of people would drive up to somewhere like the Hollywood sign and gaze at their city below them. This would usually involve some kind of deep moment, either someone contemplating their life, kissing for the first time, or reminiscing on something. Either way, I have this idea that major moments occur at places like this. I hung out at the top of this mountain for a while today. For a while, I switched back and forth between looking west and looking east, pondering what each direction meant. To the west, the mountains represent excitement, challenge, and dreams. A lot of people think of the glory of living the good life in a town like Vail, or Aspen. To the east, I initially thought of Denver, but then started to look beyond Denver itself, towards what lies to the East of Denver, toward an area that is periodically overlooked and ignored. If the west view at this peak represents challenge, dreams, and the possibility of achieving the good life, the east view represents being ignored, overlooked, and stagnation. In fact, if I had not become interested in storm chasing, I might still have no idea what this place is all about. The cultural centers of this country, primarily New York and Los Angeles, do not think about this area too much. People from large cities either just fly over this area or resentfully drive across it. There have been periods where people in large urban areas achieved greater and greater economic prosperity, while the people of the Great Plains continued to struggle. Politicians routinely ignore people living outside the urban centers as there are fewer votes to be won there. In fact, there are some people in the Great Plains portion of Colorado feel so ignored, they are developing plans to secede from the state. 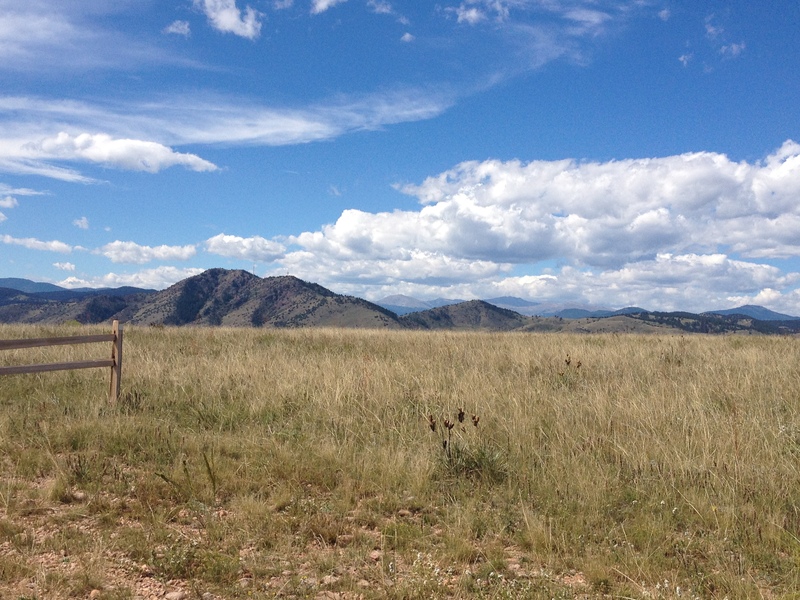 This entry was posted in Colorado, hiking, lifestyles, local culture on September 18, 2013 by Stephen Jaye.